Plans for a tunnel linking Bolivia to the Pacific Ocean have been unveiled by three architects who say it could put an end to a 130 year-old dispute between the landlocked country and its neighbour, Chile. The three Chilean architects claim the tunnel would allow Bolivia to regain access to the sea since it was defeated by Chile in the Pacific War in 1879. This has been one of Bolivia's main demands for years, and is still strongly voiced by current President Evo Morales. 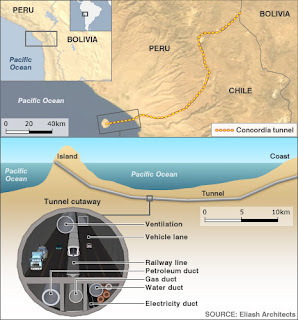 The 150km (93 miles) tunnel would run from the Bolivian border to an artificial island created in the Pacific Ocean from earth dug to build the tunnel. For more information on this highly unfeasible project click here.